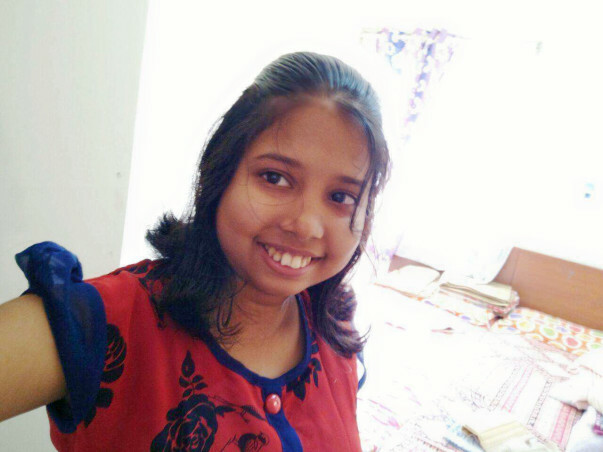 15-year-old Vanisha fought hard all her life against a deadly genetic blood disorder. A bone marrow transplant alleviated her pain, but soon after she succumbed to yet another deadly infection that has claimed a right to her life. Vanisha needs aggressive treatment to make it out of this terrible time and emerge a healthy survivor. 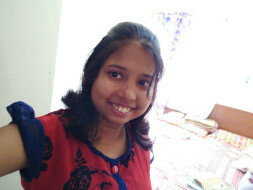 Originally from Ramnagar, Gujarat, Vanisha comes from a loving family of four including her father, Rajnish, mother, Priyanka, and younger brother, Avanish. The parents celebrated with joy when their daughter was born, but soon enough they discovered she was ill. At 9 months of age, Vanisha was diagnosed of Thalassemia Major, a genetic disorder resulting from mutated genes inherited from parents causing severe anemia. A bone marrow transplant was performed in December 2016. Rajnish, a hard-working engineer, had saved up all the money he could so his daughter could get healthy finally after years of struggle against a disease that made her weak. They couldn’t find a perfect donor match so this father gave his cells to save his daughter. The surgery was a success. Vanisha was diagnosed with Veno-occlusive Disease with CMV viral infection where the veins to the liver are blocked, and her immune-weakened body is infected with a virus that it cannot get rid of. She has decreased liver and kidney function, along with fluid retention in her stomach. This family is going through enough struggle with their baby girl in pain since she was 9 months old. Vanisha needs an imported medicine called Defibrotide (a medicine for her condition), supportive care in intensive care unit (in case she requires ventilation) and continuous dialysis. The estimated cost for her treatment is Rs. 28,00,000, and this family has exhausted all resources trying to pay off the bills so far. We would like to thank you all for the contributions to provide the highest quality of care to Vanisha. Unfortunately, despite the medical team’s best efforts, she passed away on 25th February 2017. She was suffering from a severe liver problem. Lately, she was given dialysis on a daily basis. On 23rd February, her condition became really critical. She was mostly in a semi-conscious state. She was mostly treated in the PICU. Despite prolonged treatments and repeated blood products, she could not be revived and passed away on 25th, following a cardiac arrest. I am Debotri Roy, an open fellow at Milaap. Here is an update on Vanisha's treatment. Presently Vanisha is suffering from Veno-Occlusive Disease (VOD), a very severe liver problem. She has to be given dialysis every day to remove jaundice. But unfortunately, things are not improving. I spoke to the doctor today morning. "Presently Vanisha is not fully conscious. There is a loss of brain function since the liver is unable to remove the toxins from the blood. This is called hepatic encephalopathy. It is mainly because of high jaundice. Also, she bleeding during urination. Things are really critical. However, we are trying to provide the best medication possible from our ends", said the doctor. For Vanisha, dialysis is the main treatment. She is not well oriented at the moment. The parents have been informed about her health issues. 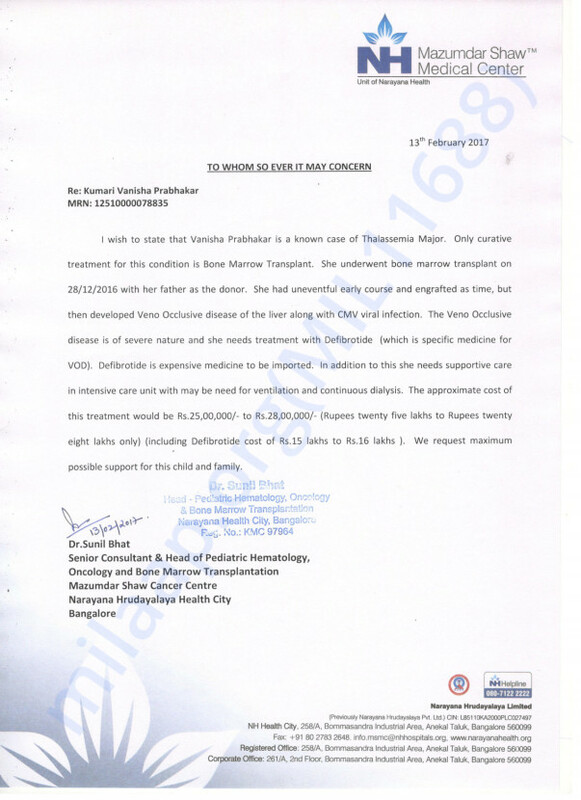 "Till now whatever medications we could provide to Vanisha is because of the donors. We just wanted to say THANK YOU in the biggest way possible. Please pray for my child. Your support and blessings mean a lot to us", said the parents. Thank you once again. We will keep you posted on her progress.